The water management of rice field cultivated in the country can do only once a week. Therefore, water always often cut. It did not often do neatly even if it asked neighbors, and a longtime trouble. Because the water supply installation was made devising it at the end about which it variously thought by the method by which the water pipe reason need not be done at all, it introduces it. 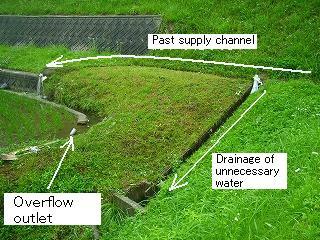 The watersupply installation of a general rice field is shown in left figure around here. Water is put in from the supply channel in a place that is considerably higher than the surface of the water in the rice field with the water supply pipe. When water is put in, some the supply channels are opened when it is this method. When water collects moderately, it is necessary to stop water. Always water is put in in a word and the water management is always always necessary with stopping worth. It is necessary to put water in always little by little because I can manage water only once a week (It is said the multiplication sink). The intake of water might be blocked with the fallen leaf, and then, other people increase and occasionally decrease the channel water. It doesn't collect neatly, and therefore, the water of the rice field is a lot and is little. The water level of the rice field is high or low and there are the following evils. If possible, a proper water pipe reason is done. Working of the herbicide worsens. Growth worsens if there is no water because the rice plant is originally a water plant. The growth of the rice plant worsens due to the decrease in the temperature at nighttime. Growth worsens because the stock of the rice plant doesn't increase when there is a lot of water when the seedling is small. The fertility that melts to water might be supplied though the water leak increases and the outflow of the fertilizer increases, too. The fertility flows out surely when the multiplication sink is done by drain from the overflow entrance. The water level doesn't change so much even if the width of the supply channel is about 30cm, and the amount of water in the waterway changes. In a word, there are some inclinations in the waterway. It is moderately supplied water to the rice field as long as water flows to the waterway. 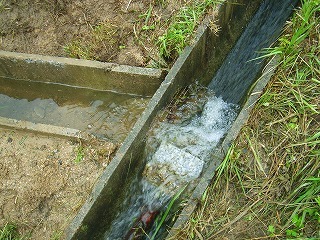 A low weir is made in the supply channel to adjust the water level, and this height is adjusted. However, when the height of the waterway is suitable, you seem may usually not do anything. Water is drained without permission by the supply channel even if it rains heavily and the water of the rice field increases too much and the water level of the rice field always steadies almost. It is usually drained from this water supply entrance though there is an outlet of other overflow types. It never gives it up even when there is no place where the water level of the waterway becomes the same as the water level of the rice field. It is possible to do if water from the waterway is led, and it stores water once by equal height to the rice field. And, the water that became unnecessary is led to drainage. It is a watersupply installation while producing it puncturing the supply channel, and making it. The supply channel and the right side of about 30cm in width are ..left side.. drawing of the gutter of the rice field ([hiyose]). The waterway and the rice field are connected directly at the position in which the water level of the supply channel becomes the same as the water level of the rice field. It will be scheduled that the measure and the vinyl chloride pipe are installed here and going of water in and out is managed later. 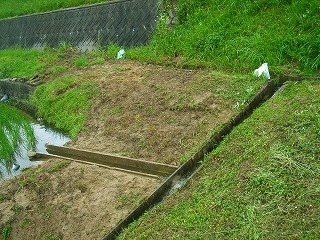 The waterway was able to be built short and easily in this rice field. Here is another rice field. Supply channel's water flows from the top right of the screen on the left and enters the rice field. This was made an unnecessary water management. It is drainage of the rapid ascent it is toward the center under the screen from upper right. 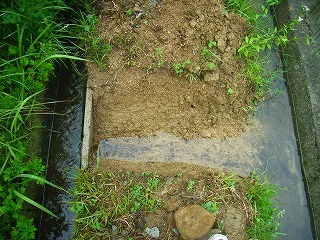 The horizontal waterway was installed from the edge of the rice field toward on the way of this drainage. A concrete waterway of about 4m in length about 30cm in width was dug up and recycled. If it was not a backhoe (heavy equipment), this was not able to be moved. It did with private car my heavy equipment that did not become it. The horizontal waterway of about 4m in length was installed as shown in this left photograph. A right photograph is an intake of water from the waterway. The stone is put for the time being and the channel water is dammed up this year. It is scheduled to make it from mortar neatly in winter. Water in the rice field usually goes hardly in and out because there is as many as 4m length of the waterway to the rice field. A decreasing amount is only replenished. The water level of the rice field always becomes constant thus. It seems finally to be opened by this by the water management.